I just weighted yesterday. I didn't expect this much. Happy Easter? I was given the seed months before and just grew it on a whim with the LA and one of my own. I turned out great. It got the far right side of the tent and did well. She did even better with extra room up when the LA had to be moved. I jumped the gun on the flush and wish I could have given another week, but the down side to this specimen is prone to mold and my hands were tied. 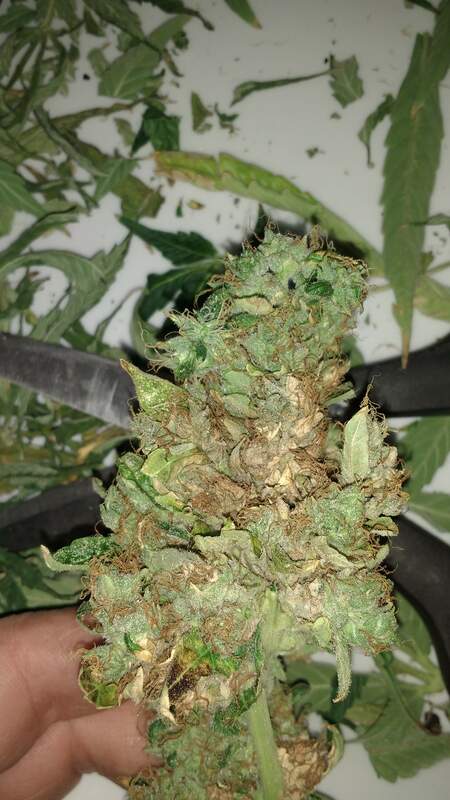 I do have another smaller plant with VERY dense buds that's sitting at 50-60% RH - not a sign of mold.. I'm happy with this plant. My grow tent is about 2 1/4 feet x 4 x 6 ft . I use an inline exhaust fan on a cycle timer. 400 watt . I have HEPA filters mounted on the little windows for clean passive air- no intake fan. To keep the RH up and temp down can anyone recommend a cycle time for the exhaust fan? With aeroponics tech what's the best amount of time to flush? In that time is it better to cut down gradual? Or completely exchange the res water?